I spent one of my Fridays in October in the jury duty waiting room (not inspirational), and during my lunch break I was enjoying the sunshine in the nearby park and saw this girl playing the violin (very inspirational!). She was at the exit of Civic Center/Grand Park metro rail station. It brightened by day so much and gave me so many good feels. She was incredible. I think we miss out on some of these random acts of street performance living in a city/culture that doesn’t opt for public transportation. It absolutely brightened my less than awesome mood. Thank you, Violin Girl! I had a lovely conversation with Brian Sonia-Wallace in October about theatre. He makes the types of I would love to do if I wasn’t scared– socially-charged, sometimes site-specific, Augusto Boal-influenced… to call it “unconventional theatre” or “avant garde” is to degrade it. We talked about how to make theatre a gift for people by asking what stories do people NEED to be receiving, in a shaman-esque way. I so want to be a shaman for my art. He is so full of joy every time I see him and has so many awesome ideas for new projects that I can’t wait to see come to fruition. His passion for theatre reignites mine, and these kind of convos remind me of being in drama school when everyone’s brains were so full of new ideas and possibilities… I want to hold on to that feeling as much as possible. To follow his projects (which you should! ), sign up for his mailing list by clicking here. I should really start putting more food on here, because food perfection is incredibly inspirational to me. Food is totally an artform, and I feel a kinship with chefs/restaurateurs. Good food is created from an inspired idea and carefully sourced ingredients– just like good film and theatre. 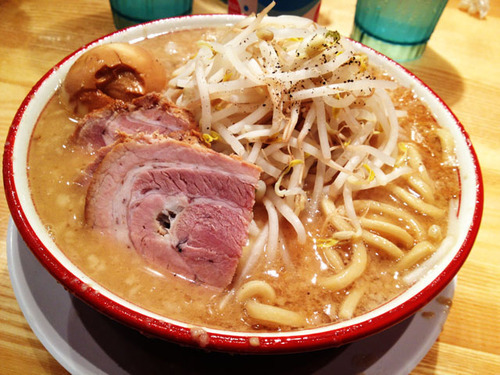 Anyway, it seems like the Annex is a smaller version of the more renowned Tsujita, and daaaaaaaym do they have good ramen. The noodles are more al dente than I’m used to, but I know that’s their jam and maybe it’s actually more legit. The broth is simply phenomenal. Sorry, Santouka. I loved you so, but you have been deliciously replaced.